1 Stück | 21,95 €/Stück Neu im Sortiment! Inhalt: 6 Farben (Rot, Blau, Geb, Schwarz, Grün und Weiss) a 15 ml, 150 g Alaun, 60 g Pulver für den Marmoriergrund. Wir senden allen Käufern per e-mail-Anhang eine deutsche Übersetzung der englischen Anleitung im pdf-Format mit! yet easy enough for beginners! A great creative group activity! fabric & gift wrapping paper! Each piece is as unique as a fingerprint! The mordant picks up the color that is floating on the size. For Fabric: Dissolve 1/4 cup or 4 tablespoons of alum in one quart of warm water. For best results, pre-wash or use PFD fabric. Do not use fabric softener. Put fabric into alum-water and leave for 20 min. Wring out and line dry. Iron fabric before marbling. Be careful not to scorch the fabric. For hard water use Calgon water softener, one tablespoon per quart. For Paper: Use a sponge or spray bottle to apply the mordant to one side of the paper. Be sure to mark the back of each paper so that you know which side is mordanted. Spray the mordant evenly over the paper and then wipe very lightly over the surface so that there is an even coat. Do not let the alum mixture pool or puddle. Lay flat or hang to dry. Prepare the marbling base or "size"
Methocel: Using a wire whisk, spoon, or blender, slowly add 4 tablespoons of methocel per gallon of warm tap water. Blend for about 5 minutes or until all methocel is dispersed. To help dissolve methocel, add 1 tablespoon of clear household ammonia per gallon of water and continue blending until mixture is clear. Pour slowly into tray or pan and let stand for at least 30 minutes. Carrageenan: Using a wire whisk, spoon, or blender, slowly add 2 tablespoons of carrageenan per gallon of warm tap water. Blend for about 10 minutes or until all carrageenan is dispersed. Allow to rest for 12 hours before pouring into marbling tray. Just before you begin applying paint on the "size," skim off any air bubbles and dust by laying newspaper on the surface and dragging it towards you. Experiment with each color to see how each color spreads. Each color will spread a little differently. Some will spread a lot and some will not. The sequence in which you apply the colors is the key to affecting your results. In general, you want to apply the colors that spread the most first. They will spread and help to keep the other colors in place. If the ones that spread a lot are used last, they will push the other colors aside and take over. Usually your last color will be your dominant color. If a color sinks, it may be too thick and can be thinned with water or a drop of dispersant. Violet and Navy are slow spreaders, they spread better if used earlier in the sequence. They do not disperse well if used last. If Fluorescents are desired use them first in the sequence to hold dispersion of other colors. Metallic and Pearlescent colors work best on black or dark shades of fabric. Use first in sequence when using with other colors. Red, for intensity in the color, use first and last in sequence. Black, for intensity of color, use first. 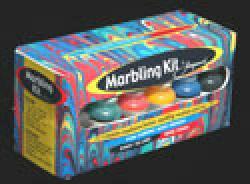 Successful sequence for our Marbling Kit, in order of sequence use: Red, Black, Blue, Green, White, Yellow and Red again. Begin by gently dropping the paint, one drop at a time onto the surface of the marbling base. Do this using an eyedropper, squeeze bottle, straw brush, or stylus dipped in paint. Colors can be placed randomly or in patterns. Concentric circles are made by adding drops of different colors to the centers of previous circles. Experiment with how much paint is applied to the surface for different effects. Stone: This is the pattern when the spots of paint are spattered or dropped onto the size without any combing. This pattern can be picked up or used as a beginning for the combed patterns. Try using different sized applicators, like an eyedropper or straw brush, to make "stones" of different sizes. Snail: After making a stone pattern, use a stylus or rake to make a snail-like pattern. Get-gel (back and forth): Start with a Stone pattern, draw through the size with a stylus up and down in one direction, then back and forth in the other. Rake Nonpareil: Start with a Get-gel, then using a rake or comb draw it across the direction of the Get-gel. Create other patterns by using variations of these basic patterns. Try varying the widths of the teeth in the combs or rakes. Use squiggly lines as you draw through the size instead of straight ones. Combine patterns, such as: Stone on top of Get-gel, Snail on top of Nonpareil, etc. Pick up the paper or fabric on opposite sides, and holding in a slight upward curve, lay it down on the size. If you are marbling paper, be sure that you have the alumed side down. The middle of the paper or fabric should touch first, then gently let go of the sides. This will prohibit any air from getting trapped underneath. If the fabric seems too floppy, you can hold by two corners of a short end and lay down from the other short edge. After a few seconds, lift the paper or fabric off from one edge. It helps to place the fabric or paper flat on a board. Rinse under a gentle stream of water to remove all the size.  The color will remain. Don't rub the surface too hard at this stage or you might smear the design. Hang on a line to dry. After the fabric has dried, heat set the paints by ironing. Then hand wash warm or machine wash on gentle cycle low agitation. Paper does not need to be heatset. To continue marbling, clean off the surface with newspaper and begin another design. When you are finished marbling, discard unused size down a sink drain while running hot tap water. Keep all paints and chemical out of reach of small children.